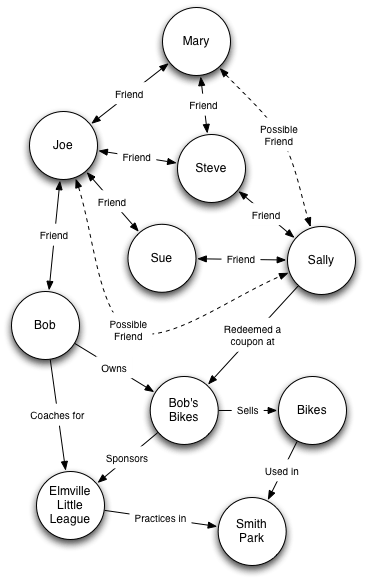 If you’re interested in things local and social (e.g., Zope Corporation‘s customers) you should read Chris Dixon’s excellent (and short) blog post about graphs. As Dixon points out a graph is the real “secret sauce” at Facebook. 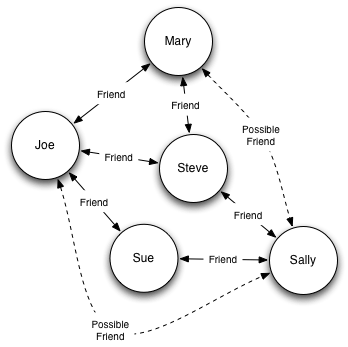 This graph lets us reason about Steve, Mary and Joe (they all know one another and are all friends). They likely have something in common. This graph also invites some inference. Two of Joe’s friends are Sally’s friends. In the algebra of social networks that suggests Joe and Sally might be friends. This is (in an oversimplified way) how and why Facebook makes suggestions about people you might want to befriend. Despite the only relationships in the graph above being “Friend” and “Possible Friend” this is all good stuff. Moreover, the graph of human relationships is arguably the most valuable one. BUT… it is not the only one. As you look at this graph see the Facebook graph extended with a day or week of news coverage and advertising in your community. Imagine this graph growing every day for a year. Now imagine how we might be able to reason about relationships between people, organizations, places, merchants, and schools. Local media organizations are in THE best position to capture this graph. Besides creating graphs, Facebook and Twitter (via Facebook Connect and OAuth) created identity systems that are extremely useful for the creation of 3rd party graphs. I expect we’ll look back on the next few years as the golden age of graph innovation. This entry was posted in Local media, Semantic Web. Bookmark the permalink.